Sometimes we think of one crisis as resembling all others and all stressful events as having a great deal in common, but for a family with children, there is no experience like divorce. Today, I came from my consultation with a divorced family in which the young son of professionals had begun to light matches. An honor student of a fine private school, the fact of the permanence of his parents divorce had recently been brought home to him at his Bar Mitzvah, where his newly remarried mother danced with his step father, but not his father. Such are the realities of children of divorce, and I had to help them find a solution. In another talking consultation with a young friend in college, I asked him what he and his girl friend had in common. Well, he said, first of all, we both come from divorced families. The answer surprised me. This 20 year old college sophomore with two sets of parents and step parents with achievements in his past and greater prospects for his future, still identified himself primarily as a child of divorce. It was not ethnic, religious, geographic, or class background that gave this pair an instant familiarity; it was their shared emotional background - the experience of split holidays and single parents - it was this - on which they made their emotional connection. These children think of themselves as belonging to a special group and feel a kinship with other children of divorce. Divorce is a crisis in which what may be good for the parents, which may fuel their emotional, vocational, and educational growth, may not be good for the children. We think of crisis as having many common characteristics but truth be told, for a family with children, there is no experience like divorce. The closest crises to divorce to a child may be death. Indeed, one 5 year old in my practice said, when entering my playrooom, that "I have come here to talk about death." However, divorce is more complex than a family in mourning because it involves the choice to divorce or not. Unlike bereavement, divorce is intended to relieve stress. It simultaneously produces new solutions and new problems. In most crisis situations, such as earthquake, flood or fire, parents instinctively reach out and grab hold of their children, bringing them to safety first. 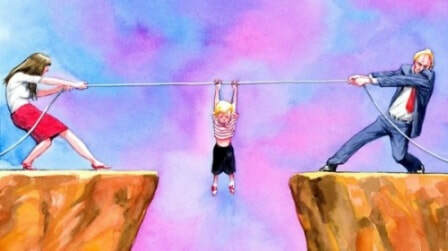 In the crisis of divorce, however, mothers and fathers put children on hold, and attend to adult problems first. Children frequently have to grow up too suddenly, and are pushed to be their parents confidantes or are emotionally abandoned. Our services can help both children and parents navigate these challenges.